Roger and I waited in two extremely long lines this month. Here are their stories. Two Thursdays ago, Roger and I woke up extremely early so that we could be downtown by 7am and participate in the hot new craze called Cronuts. If you've never heard of this before, it is a hybrid between a doughnut and a croissant. 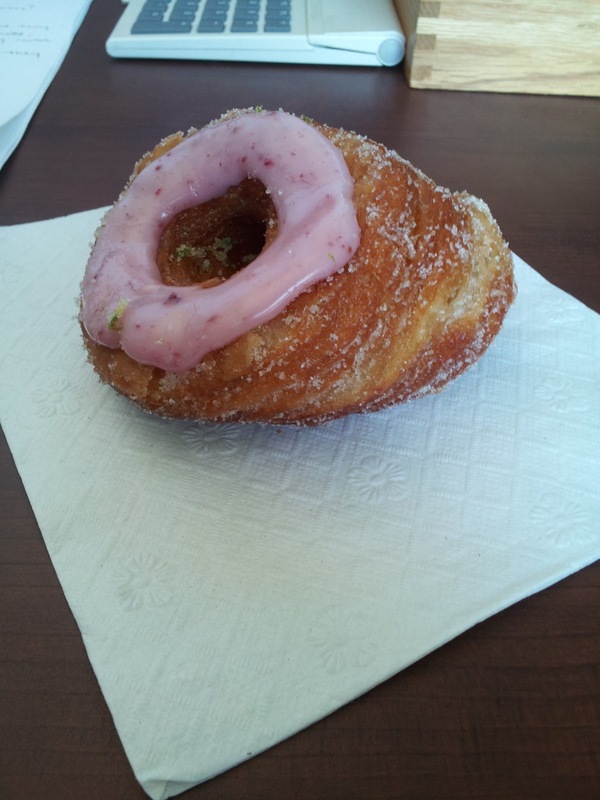 Basically, it is a deep-fried croissant shaped like a doughnut, sold at the Dominque Ansel bakery on Spring Street. Roger's coworker had one a few weeks ago, and so Roger had to try it, and as his life partner, I came too. We arrived at 7am, which we were told would give us a good shot of getting a cronut. At that point, the line was already around the block, and we were told that if we were past the middle of the park, we probably wouldn't get a cronut. We were right on the edge of the middle (erm...) of the park, and so we knew there was a chance we wouldn't make it, but we decided to risk it. At 8, the line started to move, and around 9, we were both late for work, but right up at the door. It was around this point that the woman guarding the door to the bakery came out and told the line that they would likely sell out before we got in. This caused immense panic, but since we were literally the next people in line, we waited it out and were rewarded with four cronuts. We said goodbye and each brought two to our offices to share with coworkers. 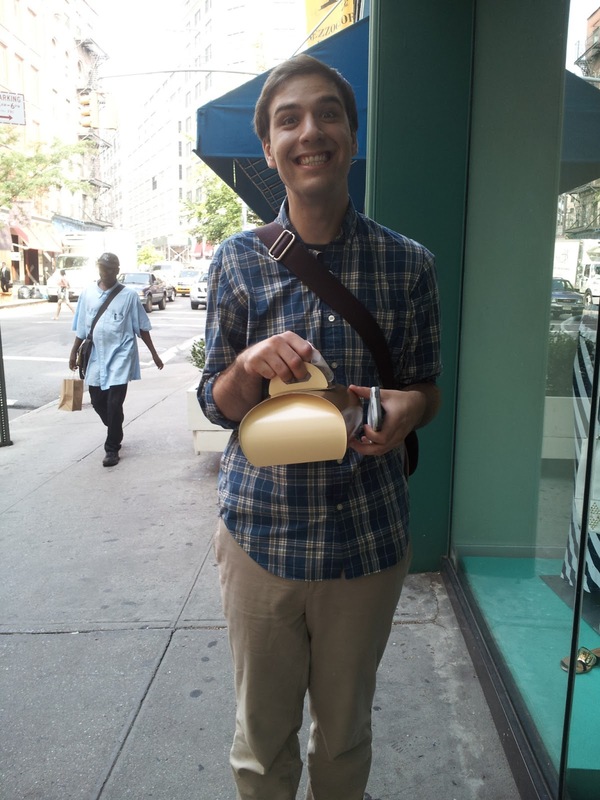 Roger, maniacally happy about cronuts. The Verdict: The first bite was incredibly greasy and overly sweet from the frosting. I was pretty disappointed. But then, I started peeling it layer-by-layer, eating from the bottom up. This was much better. There were a few layers with cream that were especially delicious, and a layer of jelly that was also quite good. The top, with the frosting, was still very sweet, but I was more used to it after eating from the bottom up. I'm glad we went and participated in the trend, but I likely wouldn't go back, at least not until that insane line settles down. In the meantime, the rose petal doughnuts at Donut Plant still win. They are the greatest thing ever, and there is never a line. 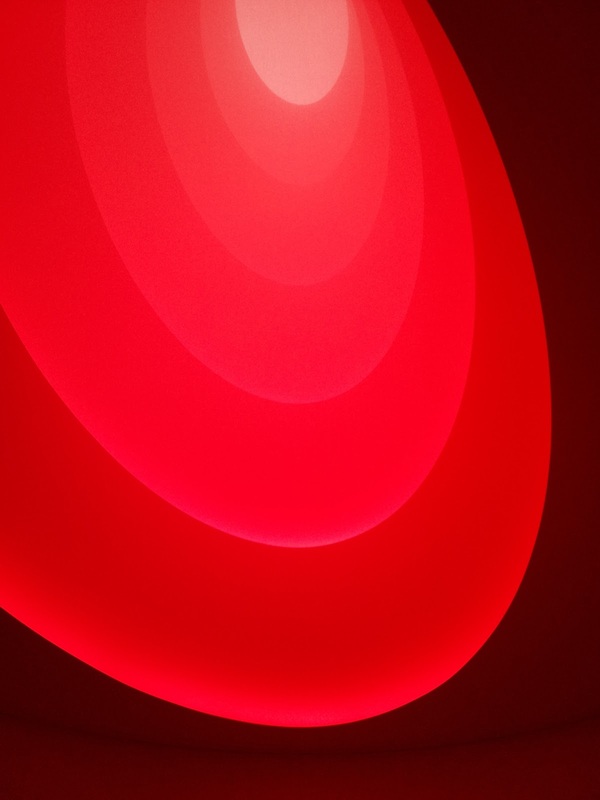 Yesterday, after a morning of cleaning and a lunch of sandwiches at Columbia, Roger and I walked down to the Guggenheim to see the Turrell exhibits there. We waited on line outside the building to get in, and then waited on a somewhat shorter line to get tickets, and then headed into the museum to see "Aten Reign," an enormous light installation that takes up most of the rotunda. A lot of people were lying on the ground staring up at it, and it was pretty cool, as was "Ronin," a corner cavity that is lighted so it looks like an opening to an extremely bright place. My description of these is my exact feeling: pretty cool, and not a whole lot more. Then, we got on the line for "Iltar," and waited as we slowly, slowly walked up the ramp. At one point, my feet were tired, so I sat down and read part of the exhibition catalog. The interview was really brilliant (and mentioned Carl Sagan, so of course I was sold), and made me think that maybe I could appreciate the art a little more than thinking it was "pretty cool." Then we waited on line for a little longer, and we could sit down right before getting into the gallery. We were on line for a total of 57 minutes, about half the time we spent on line for cronuts. The crowd gathered for Aten Reign. The Verdict: Pretty boring, and definitely not worth the wait. 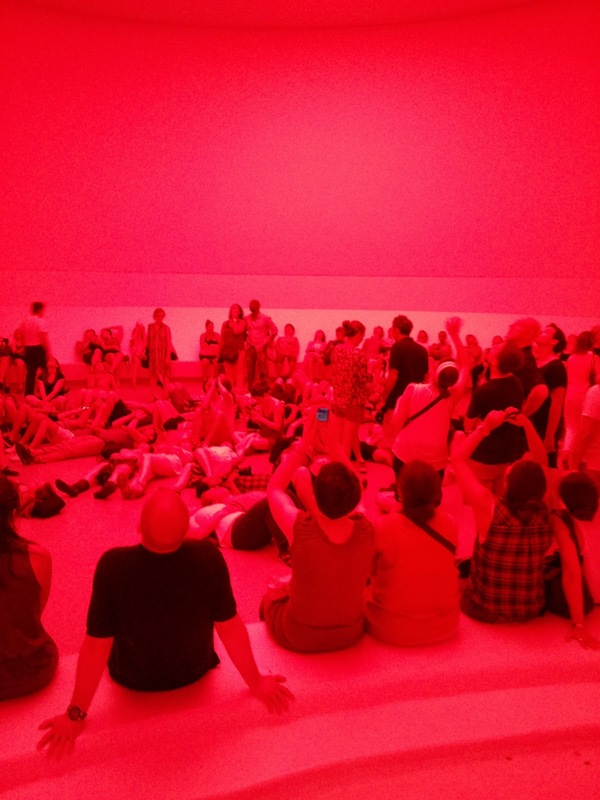 It was all shades of grey, and even with the added insight into Turrell's work, I was just not struck by the divide of realities like I'd wanted to be. I was at once disappointed that it wasn't the rain room, or cronuts, or more of Turrell's interviews. I think I'd be happier to read a book by him than see another exhibit. Maybe I'm just not a visual arts person.